MACAS, in conjunction with The Center for Emerging Visual Artists (CFEVA), is pleased to announce an exhibition featuring the works of CFEVA Career Development Program Fellows Tim Portlock, Jennifer Williams, Kimberly Witham and Allison Kaufman. All four artists share an interest in exploring aspects of the human condition, through habitats, personal relationships or histories. The works in this exhibition all tweak the environments or relationship dynamics in ways that put the viewer on notice - something more is being said - using a visual vernacular that speaks to the staged theatricality of theater or architecture. For Tim Portlock’s current digital print series, titled Ghost City, Portlock has been photographing abandoned buildings within a 20 block radius of his home. Using digital animation/effects software, he uses this source material to construct virtual de-industrialized shells of cities - empty lots reverting to browned fields, a post-industrial pastoral landscape. When viewing Kimberly Witham’s photographs, one is struck by the way several tableau genres are intermingled. There is the photographic convention of the domestic interior as shot for design magazines, which themselves are kissing cousins with the museum Period Room. 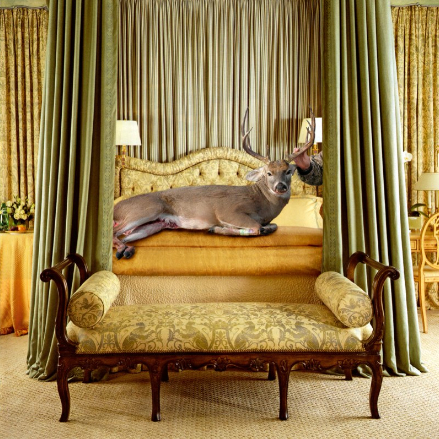 The carefully constructed domestic fantasy of the Period Room, in turn, conflated with the tableau of the Natural History Museum diorama, creates a world in which the artifice of relaxation and leisure - the promise of consumer culture - is contrasted by visions of animals in repose - or death - and a situation in which it’s difficult to tell which is which. "Trust Falls" is a silent, 5- channel installation of short, looping videos by Allison Kaufman in which she collaborates with divorced middle aged men, a recurring theme in her work. Kaufman and her subjects engage in intimate caretaking activities typical of a father and daughter, or husband and wife in early or late life. These activities, which include shaving, braiding hair, and getting in and out of a hammock, require a sense of trust and at times, a negotiation or struggle. Without dialogue, the body language of collaboration and caretaking can be magnified and the poignancy in them revealed. Jennifer Williams documents, deconstructs, and re-composes visual elements of cities, giving form to dissonance within the urban geography. The use of photography in her work is cumulative; she uses archival and current self-generated images to build large-scale collage-type forms. Williams is fascinated with the organic and idiosyncratic architectural transformations evident on a macro and micro level within urban environments, specifically New York City. Identifying and commenting upon the metamorphosis of space/place due to the renewal/disinvestment of inner-city areas is a driving force behind her work. , and has exhibited over forty artists from New York, Boston, Chicago, Houston, New Orleans and Philadelphia. The gallery’s program is focused on connecting artists and artist communities in different geographic regions through these curatorial efforts. Tim Portlock, Jennifer Williams, Allison Kaufman, and Kimberly Witham are currently a fellows in CFEVA’s Career Development Program. Artists are selected for the two-year Career Development Program Fellowship by CFEVA’s renowned Board of Artistic Advisors. While active in the program, the artists have opportunities to experience a full exhibition schedule, receive career counseling and mentorship, earn money from the sale of their work, teach in the community and participate in numerous professional development opportunities. The program serves artists who live within 100 miles of Philadelphia, are not full-time students, and do not have gallery representation. The annual application deadline for the program is November 1st. More information about the fellowship can be found at www.cfeva.org. The Center for Emerging Visual Artists (CFEVA) dedicates itself to making art careers viable for those who choose them, helping emerging artists reach their audiences, and promoting interest and understanding of emerging visual art among citizens of the community. The Center For Emerging Visual Artists, formerly Creative Artists Network, was founded in Philadelphia in 1983 to encourage the professional development and community involvement of emerging visual artists. CFEVA now serves artists through three complementary programs: Career Development, Regional Community Arts, and The Philadelphia Open Studio Tours. Philadelphia Open Studio Tours is Philadelphia’s premier fall visual arts festival and a program of the Center for Emerging Visual Artists. Featuring over 350 local artists and engaging over 20,000 members of the community, it is the most comprehensive tour of artist studios in the region and the only event of its kind in the city. Each October, the Tours include self-guided tours of artist studios and creative workspaces, hands-on workshops, gallery and site-specific exhibitions, demonstrations, artist talks, and receptions. In 2011, the Open Studio Tours is proud to present Staged as a featured exhibition. Studio Tours venues and events are divided East and West of Broad Street over the course of two weekends and run Saturday and Sunday from 12 – 6 pm. Staged will be open to the public as part of the Studio Tours West Weekend on October 1st and 2nd from 12 Noon – 6pm. The Philadelphia Open Studio Tours cumulatively provides an opportunity for the public to engage with Philadelphia’s entire arts community from a new perspective and based on individual’s own specific interests. No other program in or around Philadelphia consistently brings such an intimate and diverse cultural experience to the community free of charge and across such a large geographic area. For full festival information, visit philaopenstudios.org.